One of the basic problems today is that our land and many of inhabitants can’t speak for themselves and have no legal rights. The word “agency” in a philosophical or rhetorical sense refers to one’s ability to act in a given environment, to have power in that environment, and to have voice. In the case of our land, the non-human inhabitants speak a language that is simply not recognized as a language and those inhabitants and landscapes have been systematically reduced into mere objects of worth. The discourse of our civilization leaves no room for their rights or participation and yet that discourse determines, to a great extent, their fate. They cannot participate in the decision making about our world; they are not considered stakeholders. As such, they are the unfortunate passive experiencers of the many unfortunate exploitative decisions of that civilization. 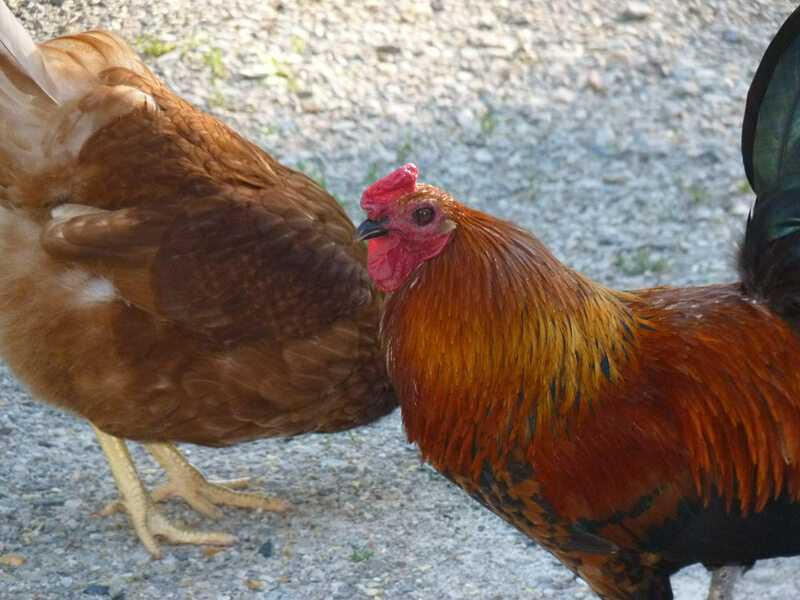 This post was motivated by some recent occurrences in my town–these are things I would never have experienced or understood living on my secluded homestead in Michigan, but here, renting in a small town in PA, I see every day. A really simple example of this is what is happening on my street in the town where I live. We had a beautiful tree-lined street when I arrived, and with the cutting of nine old trees in a 4 block area, the street is now barren. 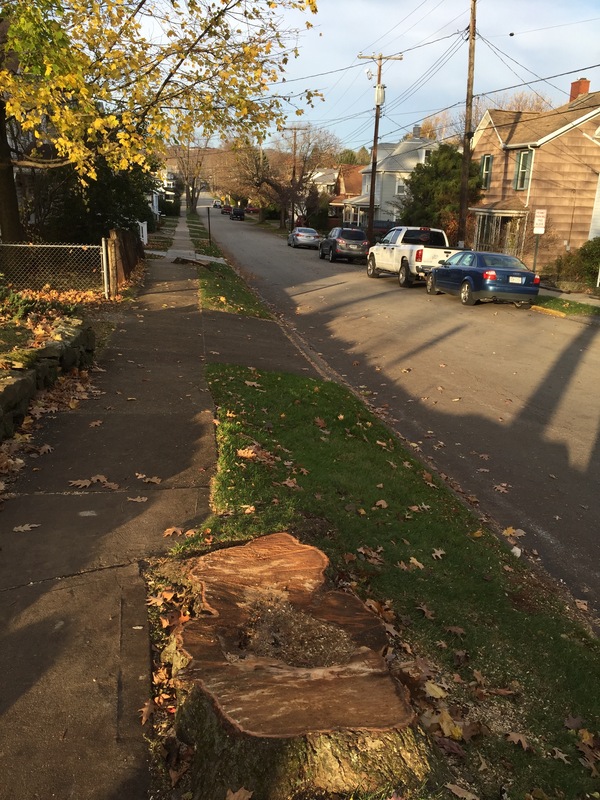 These trees had no rights, they were “in the way” of the power company or the borough to repair sidewalks, and saving them is not a conversation that anyone is having, so they had to go. There was no consideration of their right to live there, the fact that they had been there probably as long as those sidewalks….people just don’t think about them at all these days in that way. I spoke to one of our borough representatives about it, and he shared various perspectives on why it was happening. In a second simple example, the other day, I was arriving home from campus to see a truck with the rental company I am renting with stop, then park, and then two men get out with chainsaws. I had not been told anyone was coming, and I was quite surprised to see them there. I walked up to them, said hello, and inquired what they were doing. They said “we’re taking out the bushes on the side of the house.” There are five nice bushes there, some holly and rhododendron, mature and beautiful. “Why?” I inquired. “They are overgrown.” They replied. “Couldn’t you just trim them? I like the bushes, I’m renting here, and the house will look bare without them.” One looked at the other, “well, I guess we can try.” I added, “The other thing these bushes do in the summer is keep the house from overheating and help save on cooling costs in the summer. I think they are well worth trying to save.” They nodded and went back to their truck for a tree trimmer. In the end, they trimmed three of the bushes and cut one down (I have no idea). So, with these experiences helping frame my discussion today, we return to the topic at hand: the need for inherent rights of nature. Its not that every culture has had such a problematic relationship with nature; some have recognized the inherent rights of the land and non-human inhabitants and included those rights in decision making processes. Other cultures could hear the singing of the trees, the sounds of the wind, the messages in a bubbling brook and respected those voices. Clearly, industrialized culture is not such a culture, and the very industry that made us industrialization has silenced our minds and hearts to the current plight of the land–growing more tragic by the day. The land and her non-human inhabitants, in nearly all countries in the world save Ecuador, also lack basic rights, such as the right to life, under our modern legal system. This makes them both non-entities in a legal sense and unable to respond in a way that will be heard. Of course, this goes beyond just trees–animals trapped in the industrialized farming nightmare also suffer this fate, along with just about every other non-human thing. Indigenous peoples without access to the same kinds of technology and processes, also suffer this, and have suffered this lack of agency for a long time. What the land and its non-human inhabitants needs are some ambassadors. Dedicated humans who focus on learning as much as they can, sharing that information freely, and speaking on behalf of the land in a myriad of ways. I’d like to propose that druids and others walking earth-centered paths consider taking up that role. If we view the world as sacred, if we can hear and understand the messages from the land, and if we strive to live our principles, who better to advocate for it? Like the ancient druids of old, those who walk earth-centered paths such as druidry are poised to be leaders in our communities, offering a wealth of plant and nature knowledge and an example of ways of living more fully and consciously in our landscapes and lands and of the work of healing and of regeneration. This kind of advocacy work is so necessary in a culture that have so fully lost their connection with the natural world. Having “oak knowledge” puts you in a position to speak compassionately about the land and teach others of her magic. This may not be your calling, and it may not be something you are interested in right now—but it can be one outcome of this work if you feel you are called to into the service of our living earth. I’ll also note that, in the example I gave above, it doesn’t have to be a glamorous thing–it can be small, everyday moments in everyday living where you can positively advocate for change. Ok, if you’re still reading, you are interested in the idea, so let’s take this a bit further and explore the concept of ambassadorship. “Ambassador” has two primary meanings, according to the Merriam-Webster Dictionary. The first has to do with being an official diplomat, which doesn’t really make sense in the context I’m describing here. The second meaning, however, is quite relevant to this discussion. Its two parts are, “an authorized representative or messenger” or “an unofficial representative, traveling abroad as ambassadors of goodwill.” Now putting this whole “official” vs. “unofficial” business aside, as its not really relevant, we can glean some important tidbits from this idea of ambassadorship. An ambassador is someone who is a representative, who speaks on that being’s behalf, and who has that being’s best interests in mind. But what does this really look like? And how do we take on this role? I’m going to suggest it requires a few things: nature immersion; a deep knowledge of nature combined with practical skills that can reach people in a variety of ways; a nature oriented mindset and lifestyle; being an effective communicator; and seizing the opportunity. The first key area to being an earth ambassador is being in nature, often, and frequently. We can’t be ambassadors for something that we admire from afar or setup on a pedestal in our minds. We also can’t be ambassadors if we stay on the perfectly paved paths of our state forests and local county parks. We have to be of nature and understand her intimately if we are to speak on her behalf. One of the best learning experiences I ever had being in nature in one sitting was when I went on a vision quest in Western Michigan two years ago. 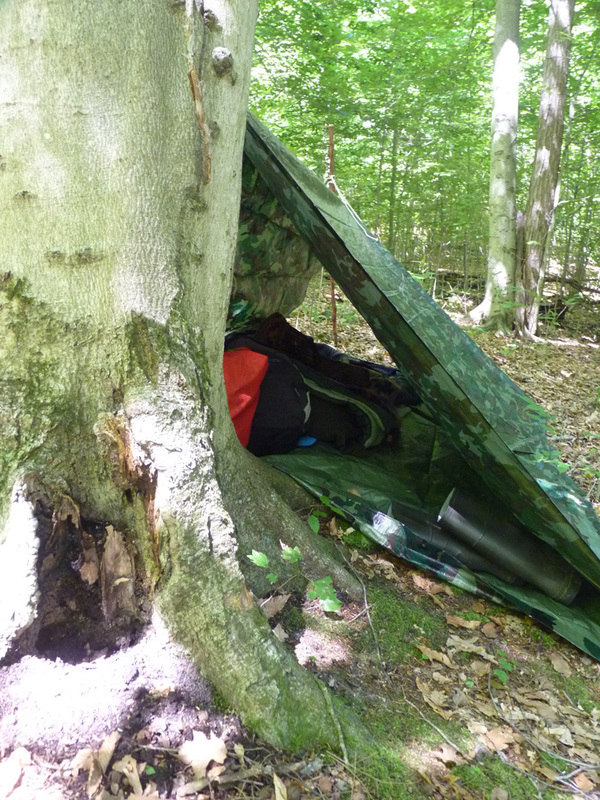 The vision quest involved fasting for two days, setting up a tarp to keep the rain out, bringing a sleeping bag to keep warm, bringing a journal to write in, doing some protective energy work to establish a sacred space and then sitting still. Staying put. Slowing down. Observing. Sitting with your back against a tree. For 48 full hours, those on the vision quest, in our chosen spots, simply were present with the land, present with ourselves, and quietly communing with the natural world (plus, doing something like this has its other benefits: it was this vision quest that gave me most of the druid tree workings series of posts). The problem that most of us have when we go into the land is that we are moving quickly, we make noise, and we don’t really see what there is to see. But when we sit still for hours, then we see the animal life, then we notice the interactions….its this immersive experience that gives us the depth of awareness necessary to be ambassadors, to be insiders, to become part of nature rather than separate from it. Because when we slow down to nature’s time, we align our energies to her rhythms and pathways, and that gives us more conscious awareness of her needs. As I’ve mentioned on this blog before, by day I am a writing professor and learning researcher, so I have a pretty good sense of how people learn, or don’t learn, as the case may be. At least in the US, our education system has been so systematically gutted that most don’t have the basic literacy. critical reasoning, and study skills coming out of high school that makes learning a fun and effective process. And certainly, one isn’t going to learn much about the topics I am discussing in most primary or secondary schools, although university settings do have good things to offer (like, say, ecology, botany, or organic farming courses, some of which I was able to take at my former institution). One of the things that an ambassador does is know those who they are representing intimately. This is not just a surface knowledge, or an abstract idea that they are “good” or have “needs” but rather this is a deep and intimate knowledge. If you want to be an earth ambassador, you have to really, really, and I mean really understand the land. In my recent post on seeing, I talk about the different levels of seeing the land–we need to move well beyond appreciation eyes and dedicate time and energy–a lot of it–to understanding the landscape. We need to understand a lot about ecology, biology, the things that have potential to harm the land, the things that can help heal it. We need to keep our eyes open, our hearts open, and our minds open and observe. If we are going to speak on behalf of someone or something else, deep knowledge is a base requirement. To be an earth ambassador, then, we have to dedicate time to improving our own knowledge base, setting aside our assumptions, and recognizing how much we have to learn. There is no substitute for investing time in learning. This certainly includes getting some good books, studying them carefully, and applying them in some way (e.g. don’t just read gardening books, plant something. Don’t just read about tree identification; go out and identify some trees, and so on). While picking up a book or two and reading carefully is a good start, its not sufficient for what I’m talking about here. I’m often saddened when I attend a druid gathering to see how much my fellow druids don’t yet know about nature or propagate assumptions about it that simply aren’t accurate–for all the time we spend in it, that critical awareness and deep understanding of what nature is and how it works is not always yet present. In their defense, most of them have been druids for a few years or less, and are still figuring out their own identity–this is not something I necessarily knew either when I started out either. But, to do this work well, its something you have to cultivate. Regardless, taking up the role of ambassador means the need for deep and broad knowledge about nature–which leads to a lifetime of dedication and study. When it comes to this stuff, you can never know any one topic deeply enough, nor can you ever know enough about the land :). Druid study programs can help fill the gap by providing some means of dedicated adult education–AODA’s in particular teaches some of the skills and knowledge I’m suggesting by way of books on ecology, making earth path changes, potential for additional Ovate studies, and intimate time in local landscapes. It was through this study program that I grew a great deal of my initial knowledge–you might say the AODA’s study program sparked the deep changes within me that, 10 years later, allow me to write these words. 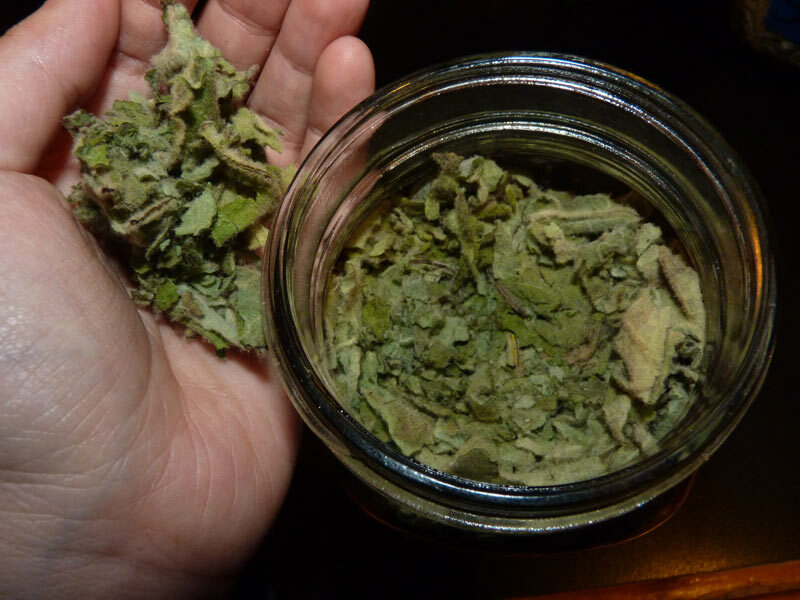 There are a lot of other kinds of training out there is also really good–for me, studying herbalism with a few different teachers was really effective to increase my knowledge of healing plants, plant identification, and botany. Organic farming courses from the biology department at my previous institution not only taught me about farming, but also about soil biology and ecology. After years of study, my permaculture design course brought everything together in a really positive way. The point is, knowledge you need to be an ambassador is not all in one place, but once you get a sense of curiosity and wonder about the world, its easy enough to learn with dedication and an open mind. The principle behind these first two points is simple: by spending a lot of time directly in nature, by interacting with nature, and by growing ecological knowledge, you develop a robust knowledge base that can be drawn upon when the need arises–and that need can sometimes happen quickly and without warning. Its one thing to know about nature, and its a completely different thing to have a mindset and lifestyle oriented to nature. We can’t be ambassadors for nature if we say one thing and do another; if our words don’t match our actions. For one, it will be hypocritical and for two, ineffective. And for examples of this, I point to Thomas Friedman and Al Gore, both of whom tried to make strong points about the earth and climate change, encouraging less consumption, and new ways of living, and both of whom were called out publicly in many venues because of their personal living conditions and for not walking the walk. Thomas Friedman lives in a 12,000 square foot house and advocates for smaller dwellings and less consumption. Gore, who advocates that climate change is human caused and that we need to radically change our lives, lives in a 20,000 square foot house and uses up $30,000 of electricity–that’s 221,000 KWH–in a single year. And you are lecturing everyone else on reducing consumption? Uh, yeah. Don’t be these guys. Living consciously and earth-centered is hard work–it takes continual monitoring, dedicated effort, and critical awareness. A lot of what I’ve been doing on this blog for years is helping all of us (myself included) take more and more steps in this direction by thinking about the stuff we buy, our waste, the food we eat, the way we manage our lands/lawns, our workplaces, or relationship with weather, the list goes on and on. I think its important to be forthcoming with where you are in your own shifts, and to be open about that with others. I always try to do that here–I talk about my struggles at various points with wrestling with the issues I’m presenting on this blog, and I encourage others to do the same. Its honest and realistic. People like Gore and Friedan haven’t actually tried anything they are advocating, and in fact, very much live in the extreme opposite direction–so nobody believes them. And worse, the topics that they are talking about–which are really serious and important–are discredited. Gore and Friedan attempted to be earth ambassadors; they have the knowledge and good communication skills backing them, but they fell flat when they told everyone else what to to do rather than living by examples. A much better strategy is to life the lifestyle first and others will come, they will seek your knowledge, and they will want to learn more–that’s what ambassadorship is about! People will look to you for guidance when they see how you are living each day. This allows you to begin to fill an ambassador role–you show how we can live differently and that lifestyle alone opens up countless possibilities for earth ambassador work. At this point, on a weekly basis, I have people ask me questions that can lead to good conversations: they ask about my beehives and what happened and then we can talk about the dangers of pesticides (I even had this conversation with my students in my first-year writing class a few weeks ago when they asked about my weekend, and I told them about my hive), they hear about the work I’m doing in town to start a food co-op to bring more local and sustainable food choices to our town, or they ask about my front lawn or permaculture, the list goes on and on. People send me photos of wild food and mushrooms to identify, like a photo of a “weed” and I tell them about its medicinal use so they keep it in their yards, and so on. I didn’t get into this with the idea of being an earth ambassador–but that’s what’s evolved from it :). Most of the work of an earth ambassador is quiet work. Building knowledge, immersing yourself in nature, making shifts, just working to do good work everyday, celebrating the turning wheel of the year with good friends. But then, an opportunity arises–and when it does–take advantage of it! My own opportunity came two years ago, where I ended up on NPR talking about Eastern Hemlock trees, their mythology, and their plight with the Emerald Ash Borer. A producer saw my blog post on them and contacted me to speak about the hemlocks. This was a rare opportunity, and one I decided not to pass up. It was a really interesting experience and allowed me to get the word out. Other opportunities happen all the time–not as public, perhaps, as being on NPR, but no less important. Opportunities to be earth ambassadors often come in unexpected ways or places. A dear friend and fellow druid in New Hampshire has found himself in a leadership position fighting an oil pipeline and compressor station–and building an incredible community in the process. Having a deep awareness of the sacred earth has helped him tremendously on this path. Another druid friend was invited to a local conference to give talks on wild food foraging, composting, and permaculture. A third druid friend finds herself often in the position of advocacy. Another converted her front lawn to vegetables and now teaches others to do the same. I can list dozens of examples; my point is, when you have the knowledge, you can use it to strongly advocate for our land and its rights. So to conclude, druids and others walking earth-centered spiritual paths have a unique opportunity to fill in a very important role in our communities–that of earth ambassadors. What, exactly, is the potential of those in modern earth-based spiritual paths to serve as earth ambassadors? We only know if we try! This post is part of a series of posts on Sacred Trees in the Midwest/Eastern Americas and their various uses. For earlier posts see: Eastern White Cedar, Sugar Maple, Hickory, and Eastern Hemlock. When I was a child, my grandfather would often take me and my cousins into the woods to learn about plants, animals, and trees. He had a place he would take us on the edge of an old field and a deep wood. We were so young when he took us, that after he died and we grew much older, we failed to remember where “grandpa’s field” was. On eventful day many years later when we were in our late teens, we found the spot once again. There, using small pocket knives, we carved into the beech trees at the edge of that field, leaving messages of longing and love for our grandfather who had passed. The beech trees welcomed these carvings, and 15 or s years later, the trees still hold those carvings. What I didn’t know at the time was that we were engaging in a very ancient—if not controversial—tradition: the creation of “arborglyphs” for honoring those who have passed, carving words into the species tree that is most associated with learning, words, books, and knowledge. While carving up a tree is not something I would do today given my spiritual path, this arborglyph practice epitomizes many of the esoteric qualities of the beech. To have a deeper understanding of this incredible tree, let us now explore the physical, medicinal, edible, magical, and mythological aspects of Beech. Beech trees are of the genus Fagus (Fagacae) which contains anywhere from 10-12 trees in Asia, Europe, and North America (depending on how one classifies them). The tree that I am discussing and specifically working with is Fagus Grandifolia, the American Beech. The American Beech (I’ll just call it Beech from here on out) tree grows to typical heights of 66 – 115 feet tall, and prefers more shady. 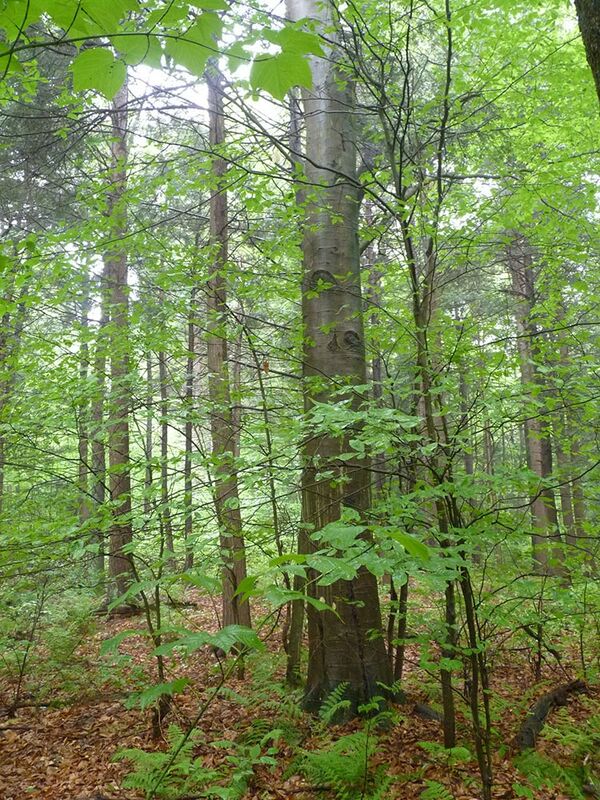 It is often found in forests with hemlocks, maples, and birches, and like sugar maple, cannot tolerate pollution, soil compaction, road salt, and other contaminants. Like hemlock, it prefers rich soil and wetter kinds of areas. 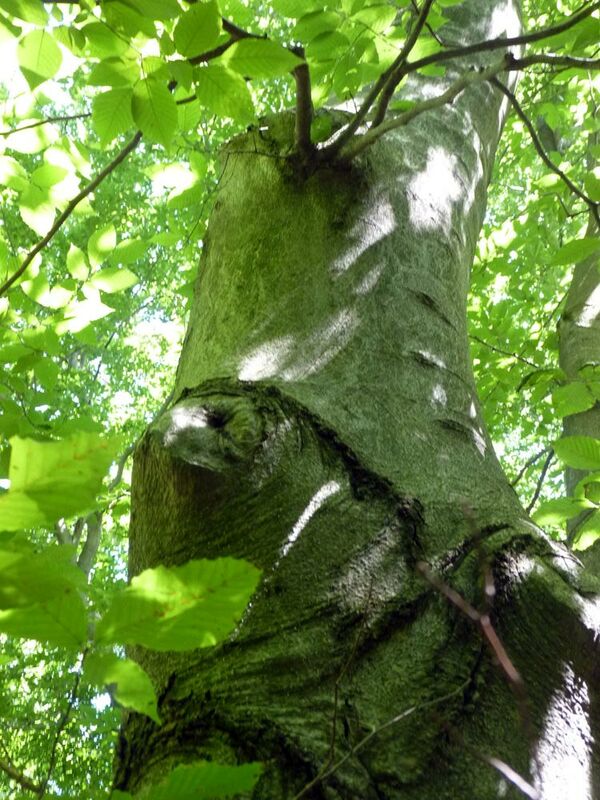 These two growth habits makes beech a true tree of the forest rather than that of the cities or towns, although very occasionally, you might find one in a more residential area. Beech is a rather slow-growing tree and takes time to establish. If you sit below beech trees, they produce a lovely warm green light, although their foliage is quite dense. If you end up in a grove of hemlocks and beeches (and these trees are often found together) you’ll be amazed by the variation and patchwork of light upon the ground—deep blue from the hemlocks and light green-yellow from the beeches. Beech trees have very light green, thin leaves that are almost like paper. The sunlight easily passes through the leaf, creating this lemon yellowish-light green tapestry of light. It really is a sight to behold. Beech trees produce tasty seeds, but they can take up to 40 years to produce their first crop. The seed itself, which can be eaten after peeling back the husk and inner shell, is wonderful tasting, reminiscent of a cross between a pine nut and a sunflower seed. If you can gather these in enough quantity (not always an easy task, especially if there is squirrel competition), you can eat them in salads, make a nice beech-nut pesto, or just enjoy them as a snack raw or toasted. Even finding a few seeds in the forest and snacking on them raw can really make your day! Young beech leaves are also edible and taste very mild, almost with a slightly sweet kale-like flavor. I like to enjoy them in salads with other spring greens. When the leaves get older, they get tougher and are not as enjoyable (like most edible leaves), but are still edible in a pinch. In the Wisdom of the Trees, Gifford (p. 150) also explains that Beech leaves were used as an alternative to tobacco by the German army in World War II and the nuts were roasted and used as a coffee substitute. I haven’t tried the beech in either of these last two forms, but its good information to know. Beech is a very tall, straight tree, and the wood is very dense, light-colored, and thick. Of all of the trees I’ve studied thus far, Beech wood has one of the widest ranges of uses: from culinary to artistic to practical. Beech wood is often used to make drums and handles on guns and other tools (it is seen as a good, less expensive alternative to walnut). Beech wood is used often in preparing foods or beers—in some parts of Europe, beech is used to smoke sausages or other meats and beech wood may be used to smoke and dry out malt for beers. In the USA, even major beer manufacturers use beech as a “fining” agent near the end of the brewing process for flavor enhancement. A type of rayon fabric called “modal” is made from the chemically processed and spun cellulose fibers of the beech tree—note that this fabric, and other rayons are not very biodegradable, and much of it ends up in the oceans—so not really a great use of this tree. Finally, beech-nut fattened swine was traditionally known in Europe to be the absolute best tasting pork and ham. Even Culpepper mentions this in his entry on beech—and suggests that the beech nuts are particularly nourishing to animals that eat them. Artists, particularly those in the 17th and 18th centuries—including Rembrant, Lorrain, Cozens, and Gainsborough—used beech soot mixed with water to make a transparent ink/pigment called “soot brown”, or bistre. The soot was gathered from a chimney after burning beech wood, and then mixed with water, and later diluted with water for whatever effect the artist wanted. The color is dark gray-brown with a hint of yellow. I have yet to experiment with making this ink (I currently lack a chimney from which to gather soot!) but I could see it being a lovely compliment for other tree-based inks that I have made, including buckthorn, elder, and walnut! I have discovered that Beech also has a use in hand papermaking. In the winter, the beech trees often retains some leaves and they turn a papery ivory color as the winter progresses. The leaves typically are not dropped by the tree till spring. I use these winter beech leaves in papermaking—they don’t contain fibers enough to make good pulp, but they are great added to something else. The whole, feather-thin leaves, are beautiful layered in a handmade paper. I’m sure there are many other creative things you can do with the dried beech leaves. Archeologists use the term “culturally-modified tree” to describe human-made carvings and modifications to trees—these trees become artifacts that record messages sometimes centuries after they are carved. Native American peoples and other ancient tribes certainly carved such glyphs in trees—remnants of which can still be found today in some elder Beech trees. To create arborglyphs, three trees are typically used: beech, birch, and aspen, with beech being the most popular due to its light colored and smooth trunk. These arborglyph carvings included both images and graphics, and had, in some cases, substantial personal or cultural significance. 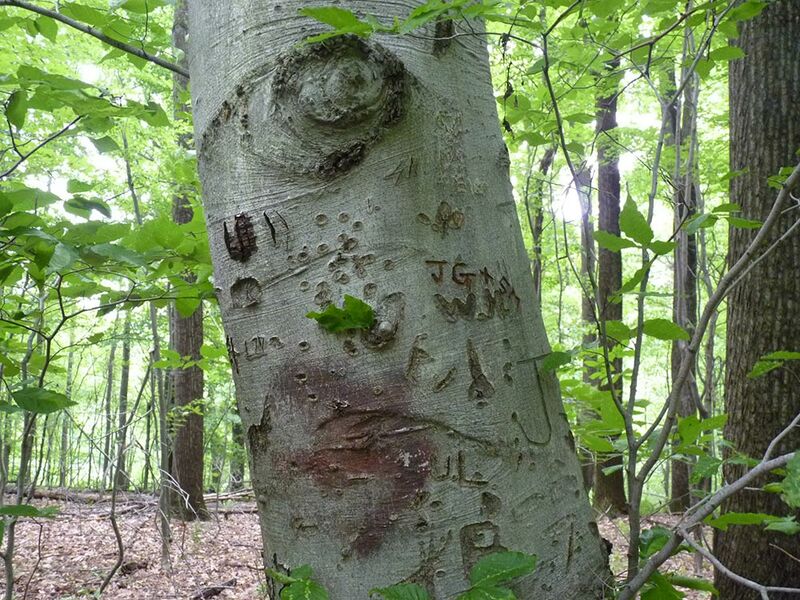 As I mentioned in my story opening this post on beech, many people even in the present day choose to carve their sweetheart’s name or their own on beech trees—if you see beech trees frequented by people, they often have carvings. In visiting a local park in Indiana, PA, my current hometown, there was a 270 acre park within walking distance of my home. 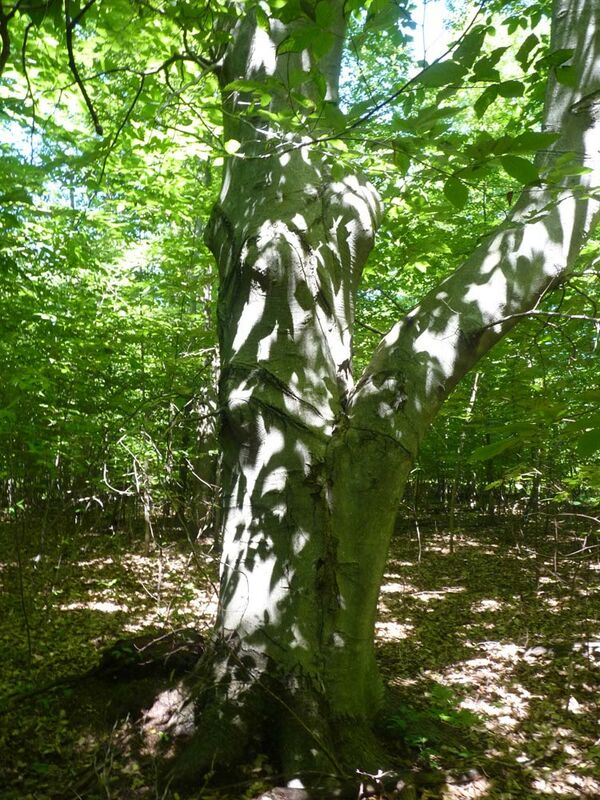 I saw only one larger beech tree along the many trails we walked—and that one beech tree was carved up by passerby. So many beech trees along pathways I visit suffer this fate. The bark of the beech is one of the lightest and smooths of the forest, and really does make a nice canvas upon which to create! Sometimes, when I’m feeling whimsical, I’ll take some charcoal chunks from a campfire to a large beech tree and add beautiful patterns to the bark—with permission of the tree, of course. Depending on what side of the tree I do this on and the weather, the patterns can last a long, long time. One set of patterns in a trunk sheltered from the rain are still there after several years! I see this as a more tree-friendly version of carving arborglyphs. Examining the beech tree, particularly the seed, through sacred geometry and numerology reveals the magic of the beech. Male and female flowers appear on the same branch (which suggests duality and the connection between the male and the female energies). Beech seeds have an outer husk with little burrs, on it, almost looking like a miniature chestnut husk. 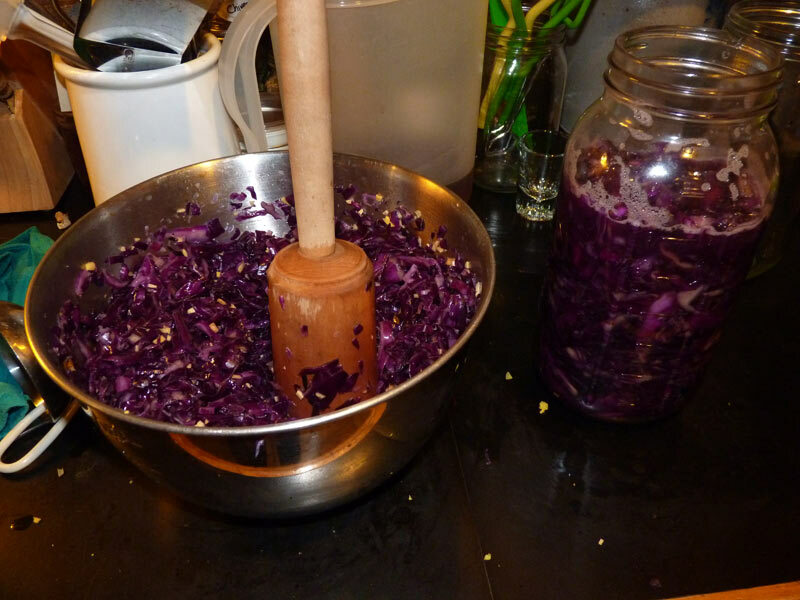 When the husk is opened, the magic begins. Beech seeds have an outer husk that opens up in four ways to reveal two tan, semi-hard inner seeds that have three sides each (that is, they are tetrahedrons), placed against each other forming a four-sided, pyramid shaped double seed. So here we have four husk petals, spreading outward in the four directions. In separating the two seeds, we are reminded of the binary, which represents so many things in our world—night and day, male and female, black and white. The shape of the seeds themselves, however, show us the tertiary: tetrahedron-shaped sided nuts, that which is actually consumed. The lessons here are many, and the synthesis of the sacred numbers 2, 3, and 4 are present. The number 40, the typical time it takes a beech tree to produce nuts, is also highly important to esoteric lore. In many traditions, including traditional Jewish Cabbalism, you would not start your advanced esoteric studies till the age of 40. It is at this point that as a human being you were ready for the advanced work—and it is at this point that the Beech tree begins to bear fruit. Of all of the trees I have covered so far in this blog, the Beech has the least written about it in the Native American stories—so little that I don’t have any themes to present. Beech shows up only four times in the database of over 2000 stories I am using for this project, and in most cases, its simply present as a “tree” in a story, in the sense that something is done to or that is simply growing with other trees in a fertile forest. Of these four stories, only one is worth noting: the Micmac Creation story. 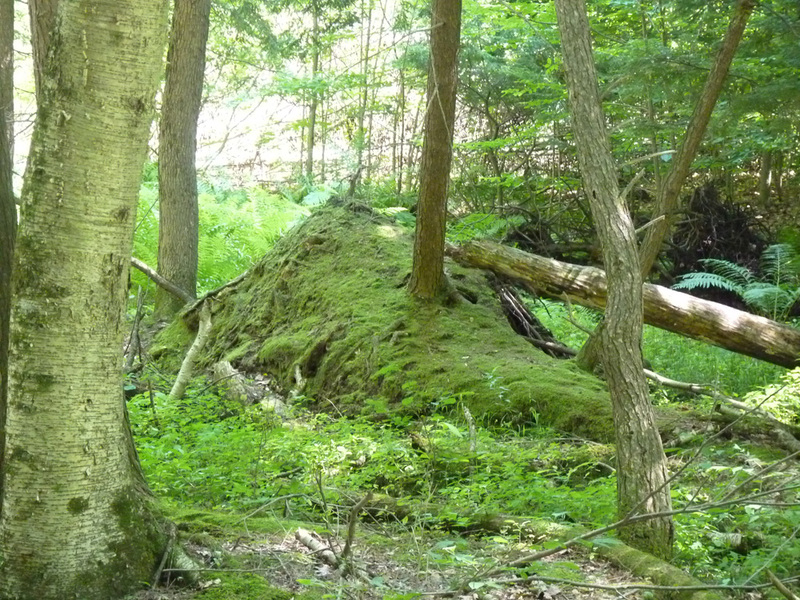 As part of the Micmac creation story, a sweatlodge is created from seven alders, seven wild willows, and seven beech saplings. The lodge was covered with moose, caribou, and deer hides and mud. The lodge is entered by seven men, who undergo purification and come out clean and like newborns. 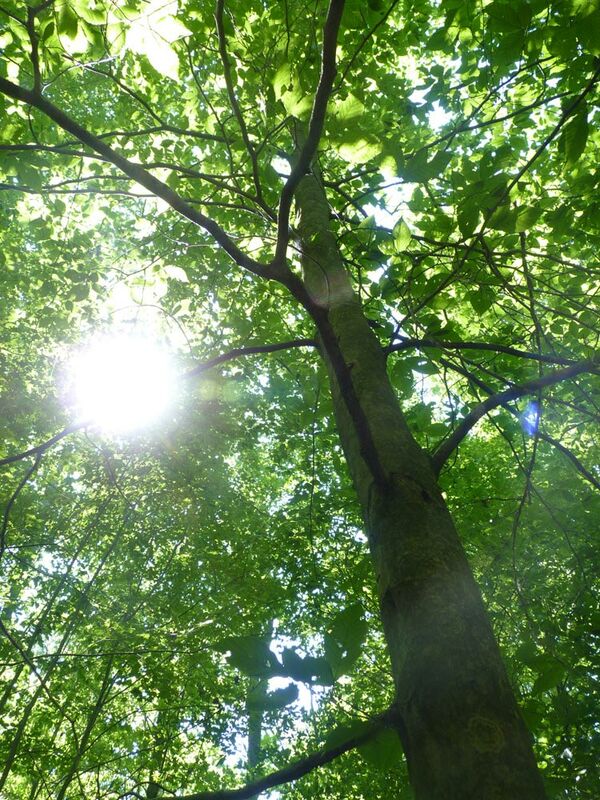 So we see beech as one of three trees holding sacred space for human ceremonial purification. One more Native American story, however, may have relevance. Interestingly, like the Oak, the beech is the only other deciduous tree in this climate that holds its leaves on its branches till spring and beyond—this has profound implications. Specifically, if we look at the Seneca Legend “How the Conifers Show the Promise of Spring” we see that the conifers hold their needles till spring to eventually defeat the winter and encourage the return of spring. In the story, the Oak, likewise, holds his leaves and stands with the conifers to help battle back the winter. This, to me, suggests that Oak keeps his power even through the winter months when the other trees are resting. The only other tree that I have seen do this in my bioregion is the Beech tree—and yet, its not mentioned in the story. I do think the beech holds a different energy during the winter months. Given beech’s substantial connection to books and learning, and the fact that most studies of any kind take place during the winter months (due to traditional farming calendars that we still have today), I wonder if the beech is retaining its power because the dark months of winter are a time of study, reflection, and knowledge seeking—those aspects which the beech presides over. Scott Cunningham presents the many folk names of beech: bok, boke, buhe, buk, buke, faggio, fagos, faya, haya, and hetre. The first five of the names on his list give us deep insight into how humans have come to use and understand this tree and how this relationship is woven into the fabric of many European languages. The very first books were made of beech wood, where the beech would be thinly sliced and bound together. 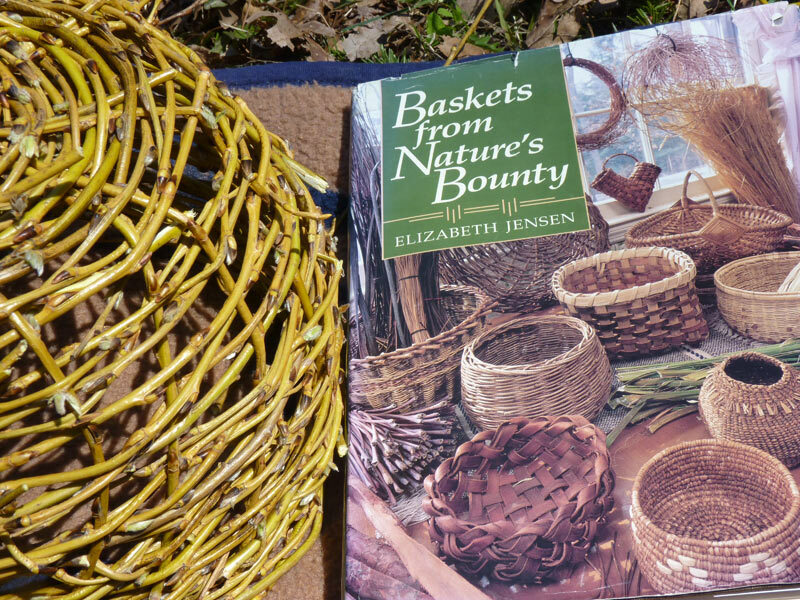 A triad of physical connections now exist with the beech tied to books and learning: its ancient connections to the physical book, the creation of bistre from beech soot, and the physical face of the tree used for carvings, a triad of connections to books and learning. From an etymological perspective, we can see connections between beech and words for literacy/books/writing in many European languages and traditions. In Gilford’s The Wisdom of the Trees, he demonstrates the clear connections in our language between books and beeches. “Boc” was the word for beech in Old English, and later that word became “book.” German, a close relative of English, uses “buche” for beech, which later became “buch” (book); “buchstabe” is the word for alphabet. Finally, “bok” in Swedish refers to both the beech and a book. Woven into our very language is the connection to the beech. According to Gilford, Beech has connections to many deities associated with trees: Ogma, the Celtic warrior god of the Tuatha De Dannan, who is credited with inventing the Ogham. Beech is also connected with Hermes/Mercury (the messenger), Odin (the supreme God of the Norse, who gave the gift of runes), Chronos (the Greek god of Time and cycles); and Thoth, the Egyptian god of wisdom and mathematics. We can see clear themes emerging: the beech associated with divination tools, learning, wisdom, and other kinds of messages. Traditional folk magic suggests that Beech wood or leaves can be carried to enhance the flow of creativity (so in druidic terms, it has a connection to the flow of Awen). Its also associated with wishes, where one folk magical tradition has a person write their wish on a beech stick, then bury the stick in the ground. As the stick returns to the earth through the natural process of decomposition, the wish will be manifested in the world. A final piece of folk lore suggests that beech is also tied to prosperity, but I had a hard time tracking that beyond Cunningham’s work, so I’m not sure where that theme comes from beyond Cunningham (who I am generally skeptical about). Beech is sometimes included as an additional Ogham in the original Celtic Tree Alphabet. It is represented as a curly cue and is titled “Phagos.” Since it is part of the last five fews, however, its not consistently used as such. I generally refer to the presentation of Ogham in the Druid Magic Handbook by John Michael Greer, which presents beech as the Ogham Phagos, and, it is connected to lore, learning, education, knowledge and study as well as lessons learned from the past. There is hope for trees. In the first stanza Taliesin describes the renewal of the beech tree, which I interpret as the dropping of the dried, paper-thin leaves in the late winter so that the tree can renew its leaves with the coming of spring. This suggests that the beech has a great deal of power during this time of early spring. The second stanza has the beech seems to be using literacy-based spells and litanies to prosper and bring hope to all trees. The beech, as the holder of knowledge, also gives us access to this wisdom and knowledge. The presence of the Oak, another tree of wisdom, further cements this emphasis. What a powerful scene and delightful tree ally we have in the beech! Culpepper describes the beech as being governed by Saturn. Saturn is connected with overall weakness and chronic diseases, all of the bones, joints, and connected tissues; lung-related issues, and also the skin. So Saturn can help leaves as cooling and binding, which he suggests they be applied to “hot swellings” (in traditional western herbalist’s stems today, the beech seems good as an outer compress for inflamed and/or infected areas that are swollen or hot to the touch). He says you can use the leaves as follows, “you may boil the leaves into a poultice, or make an ointment of them when time of year serves.” He suggests that beech can treat dry scaly skin, dandruff, and other kinds of skin diseases (eczema, psoriasis, or herpes). Another way to use beech for the above conditions is to find water in a hollow of a decaying beech, it can be used for both human and animal to wash away these issues. The Beech also has a medicinal use of a more energetic nature. The Bach Flower Remedies, a system similar to homeopathy developed in the 1930’s by Edward Bach, includes Beech. This system collects the dew from flowers and then dilutes it down considerably, to leave an energetic signature of the plant as the medicine taken. Beech is used for intolerance of all kinds and the associated issues stemming from that: arrogance/lack of humility, finding fault and blame in others, criticism, condemnation, and a lack of sympathy for others and their circumstances (As described in Vohra’s Bach Flower Remedies: A Comprehensive Study, 2004). Now I find this interpretation of the Beech particularly interesting, as beech is a tree associated with learning and wisdom (and therefore quite air dominant). The negative qualities of air (intolerance, lack of humility, criticism, lack of sympathy, lack of compassion, and so on) are exactly what the beech cures. So we can see the beech here being associated with the positive qualities of air, and aiding one in balancing the negative qualities of air in their lives. 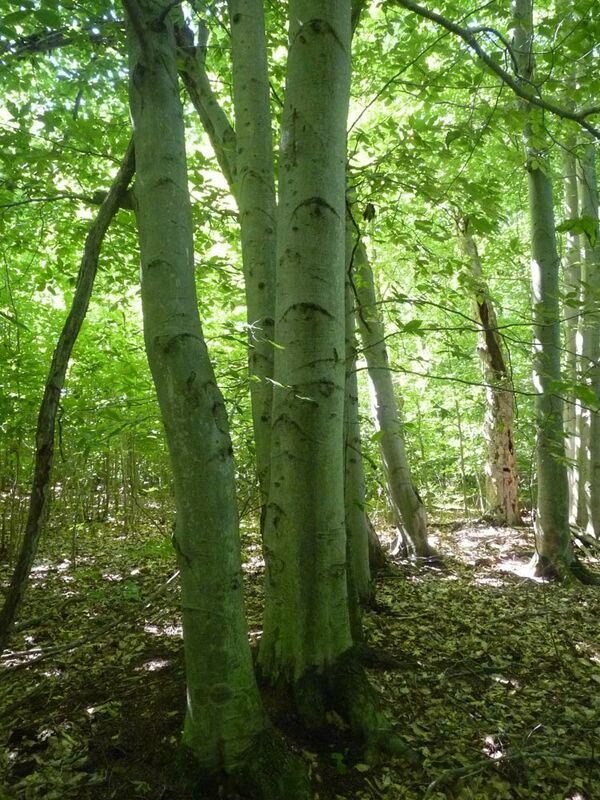 Beech trees have a welcoming energy to them. They physically brighten up a forest with soft light and bright trunks. In my own spiritual work with trees, I have found that beech trees have extremely positive energy that melds well with human energy, that they are always willing to share and teach, and that they are one of the most accessible trees of the forest. In an earlier post, I described the process of finding the “face of the tree” and using this face to help you connect on a spiritual level. Beeches are the very easiest tree to use this practice with (and the tree that taught me the practice). This is truly a tree that reaches out to humans and has knowledge to share. Connection to writing, writing systems, literacy, and messages. 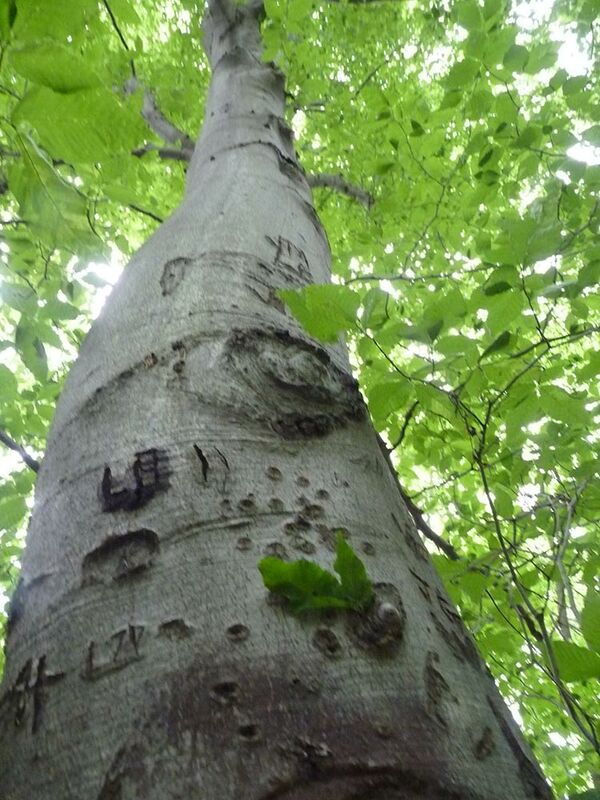 Beech’s etymological connection to book, and the fact that the first books were made with these trees, and the messages carved into the trees suggest a strong connection to writing and literacy. This tree could, for example, be useful to those who are writers, who are looking to become writers, or anyone who wants or needs to craft a compelling message with words. This tree could be useful to someone who needs to get a particular message out. Connection to knowledge seeking, wisdom, and wisdom of the ages. The Beech has a more broad connection to any kind of learning or study. Its power is retained during the traditional months of study and it is associated with gods of wisdom and learning. This tree could be useful to anyone wanting to learn new knowledge, skills, or create new knowledge themselves. Connection to sacred human knowledge (sacred geometry, numerology). Beyond knowledge and literacy, the beech also seems to have a particular connection to specific kinds of magical knowledge used and understood throughout the ages. The beech seed itself expresses magical and profound sacred geometry. Furthermore, the tree is able to carry such knowledge on its bark or in beech books. This suggest that those wanting to study magic, sacred geometry, sacred mathematics and numerology, and other such areas would find assistance from the beech tree. Connection to Divination and Magical Written Systems (Ogham, Runes): The beech, likewise is associated with magical writing systems and divination practices, especially those employing magical alphabets like Ogham and the Runes. This suggests that those studying these systems or seeking aid from them draw upon the magic of the beech tree. Connection to creative expression. The beech tree is connected to forms of expression that require a pen or some other writing instrument. Arborglyphs, the creation and use of bisre, and anything than be preserved on a book page fit this. Artists involved in drawing, painting, sketching, or creative writing. Connection to preservation across time. One of the great things that the book did for people was to allow thoughts to be written down exactly and preserved across great distances and time. Pre-literate societies relied on memory and various mnemonic devices to pass on general stories that were reinterpreted over time. With the coming of the written word, spoken language took on new form, to be preserved and moved. The beech epitomizes the ability to preserve our thoughts, feelings, and expressions over great lengths of time. This suggests that those wanting to pass something on, over time, or preserve something seek the aid of the beech tree. Connection to lessons learned over time. These might be past life lessons, lessons from an earlier part of your life, or lessons reinforced again and again. The beech asks that you remember what time has taught you, and to move forward having integrated that knowledge and not to make that same mistake again. I hope you have an opportunity to get to know the amazing beech–truly a tree worth learning from!